Summer has always been my favorite season but as a blonde hair, blue-eyed, and fair skinned person, the extra time spent outdoors does present certain challenges. For instance, after spending 4 hours on an inner tube, floating in the lake with friends last week, even the three reapplications of sunscreen didn't help prevent the nasty sunburn I obtained. Having spent some time outside already this summer, walking the dogs and hiking, my arms, face, and shoulders fared ok at the lake. However, my legs, which rarely see the light of day, and the little parts here and there that my swimsuit bares, did not fare as well. 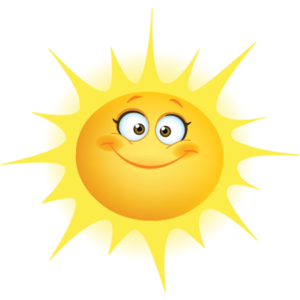 While the sunburn, especially on my legs, was not especially pleasant, I took the opportunity to try out some Perfectly Posh products - either new products I had not tried or products I had not tried for this particular issue. Below is my experience. 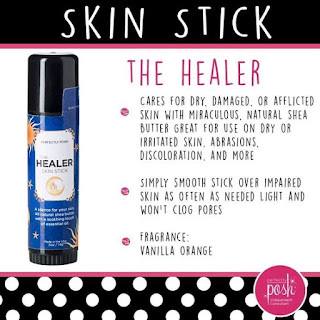 The Healer Skin Stick: While I have been a fan of this amazing little stick since I first tried it, using it on sunburn took it to a whole new level. The little spots between my chest and armpits, usually covered with bras and shirts, was not as concealed with a swim top and suffered some sunburn. Pink and burnt, it was miserable trying to wear a bra in the days following what I will refer to as "the great sunburn incident of 2018." I applied the Healer to those spots and not only did it take the sting and rawness out, but within only 2 days, it was healed and the redness was gone. Catch Me If You Tan: First of all, I cannot get enough of this scent. Citrus and vanilla scented coconut balm...it smells like summer. It smells like summer, in the tropics, on the beach with a cabana boy fanning you while the ocean breeze dances over the waves and through your hair. That might be a tad bit of an exaggeration but I am telling you, it smells amazing. But the best part is that it works just as well. It's ridiculously hydrating, leaving skin that's seen too much sun, soft, moisturized, and it is full of free radicals to fight skin damage. You Apricaught Me! 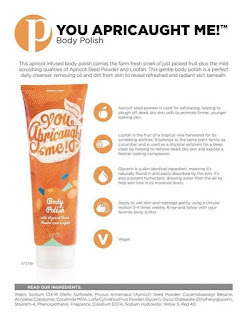 Body Polish: As I started to heal, my skin started to peel and I felt like I was molting. No longer as tender and painful, I used the body polish in the shower to exfoliate the peeling skin. Apricot, vanilla, and Tonka bean made this scent incredibly inviting, but subtle enough it was far from overpowering. My skin felt so good as I stepped out of the shower, but what impressed me most was that the next day, and the day after that, my skin still felt soft and amazing. 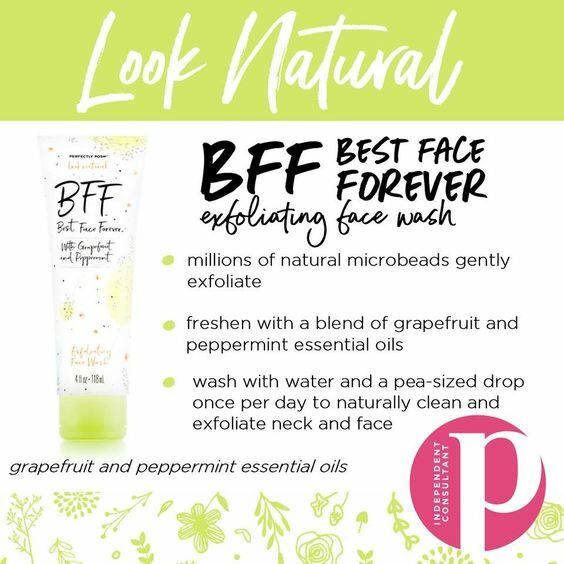 BFF: Best Face Forever Exfoliating Face Wash: After using this stuff, I really don't think another face wash will ever do! 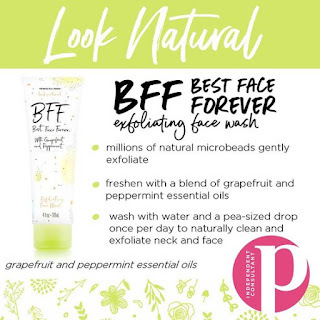 So many good things about this face wash, but I will start with the exfoliation factor. 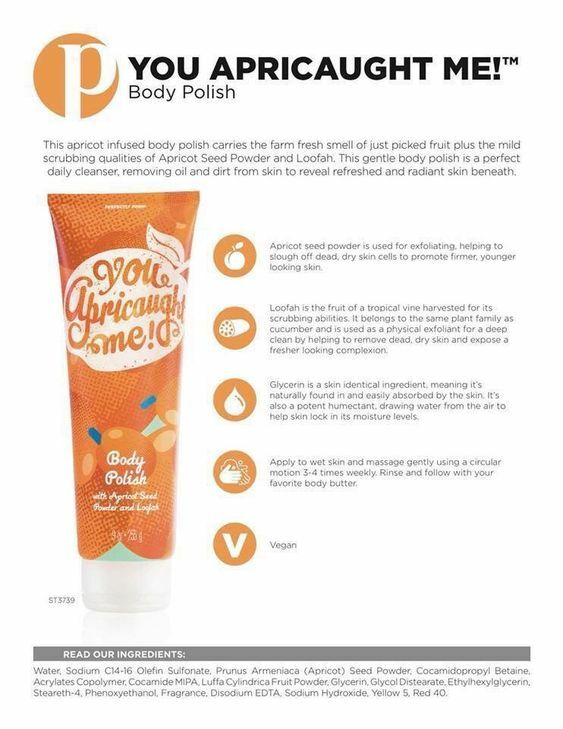 Remember the apricot scrub you used as a teenager that basically felt like sand? This has little sugar beads that feel so gentle that it actually feels kind of good! Then there are the peppermint and grapefruit oils that remove dirt and excess oil. Add in the aloe vera to smooth and moisturize. I know I sell this stuff so I am a little biased, but if I didn't care for it, I would let you know and focus on another product. However. the mix of peppermint and aloe left my face with the coolest, softest feeling face I think I've ever felt. And much like the products listed above, the awesome part was that it lasted for days! It's not a good idea to touch your face with your hands a lot throughout the day, but honestly, I caught myself doing just that because I couldn't get enough of how soft and healthy the skin on my face felt! 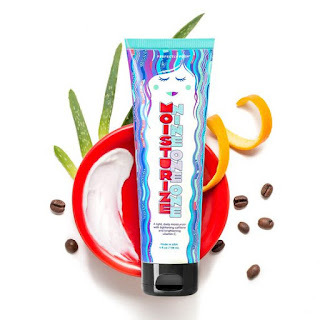 Moisturize 911 Facial Moisturizer: Truthfully, after the BFF exfoliation with aloe, if I hadn't needed some extra moisture for the sunned skin, I might have skipped this step, but I am glad I didn't. This moisturizer went on so smoothly, I could feel the moisture sinking in and my skin immediately felt more hydrated and fresh. Aloe is also a main ingredient in this product and it was apparent when my skin immediately looked brighter. Another great perk of the aloe is that it helps reduce the appearance of fine lines and wrinkles. So that's it! After a sun mishap that I am sure I'm not the only one to experience, I was lucky enough to end the experience with amazingly soft, hydrated skin that felt incredible! Check out these products and more at http://jamison.po.sh and feel free to ask me if you have any questions! Wow! These all sound like great products. I am fair skinned and freckle, so I burn easy too. I hate sunburns! 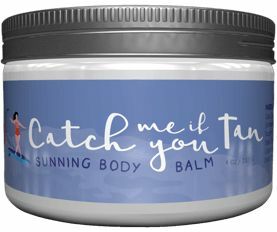 I got to try the Catch me If You Tan that sounds like a great product. The sun and I have a long history of a love hate relationship lol. What a great list of products to help me have glowy skin throughout the summer!